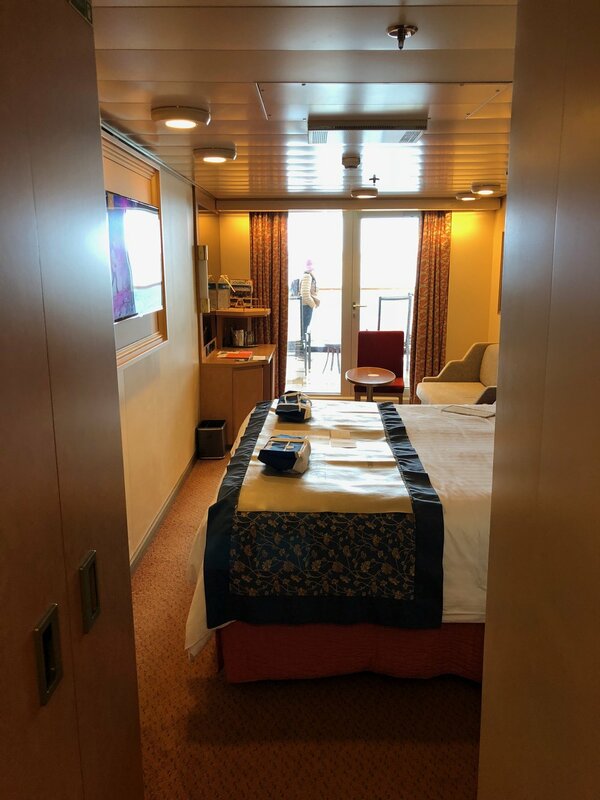 After sailing in the Neptune Suite on the 2017 cruise, my first step into the Verandah Stateroom this year was fascinating for its differences. Put very simply, the Verandah room is much smaller; about 212 square feet versus 500 square feet for the Neptune. Uniquely, the balcony was actually larger, due to the room being on the stern. Most Verandah Staterooms have smaller balconies, but all cabins on the stern have dramatically longer balconies. In all, I have no regrets about choosing a smaller cabin for 2018. With three guys sharing a cabin, as we did in 2017, the Neptune was much more comfortable, but unnecessary for a couple. You can read more about the Neptune Suite on the MS Westerdam on my post from last year’s cruise. The bed in the Verandah Stateroom was fairly comfortable, though like most ship beds, it had a hard divider. Because the beds are built to split in half, the center of the combined bed is very uncomfortable, and can’t really be used. The balcony on the stern was a major upgrade (even from the Neptune Suite). There was rarely any wind across the deck, and considerably more shade over most of the day. Because the room was on the stern, there was definitely more mechanical noise, and some additional ship motion (compared to midship). The mechanical noise was quite mild though (I never felt the need for earplugs). The ship motion was more noticeable, but didn’t bother me (or my partner, who is far more prone to seasickness). Would I choose this cabin again? Absolutely! While I think I would be happy in an Ocean View cabin, the Verandah is a reasonable upgrade for the cost. And the rooms on the stern offer a great balcony. Enough reading already, lets get to the pictures! Looking for 360 pictures? Scroll towards the bottom, as they make it difficult for mobile users to scroll through the page.